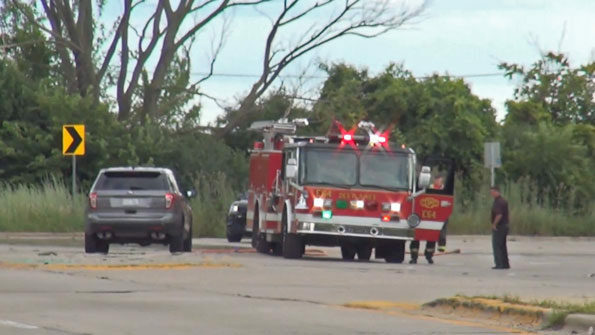 A 40 year-old man was killed Friday afternoon after a crash on his motorcycle on the northbound side of Mount Prospect Road on the curve just north of Touhy Avenue. Des Plaines police and firefighter/paramedics responded about 4:14 PM Friday August 11, 2017 to a report of a serious motorcycle crash with injuries. Mount Prospect Rd and Touhy Ave Mount Prospect, Il. Police and firefighter/paramedics received a report that a motorcyclist was hit by a car and was down unconscious. E62 crew on arrival reports the crash is on Mount Prospect Road north of Touhy. The crash was apparently involved the motorcyclist losing control of the motorcycle with no other vehicle involved.